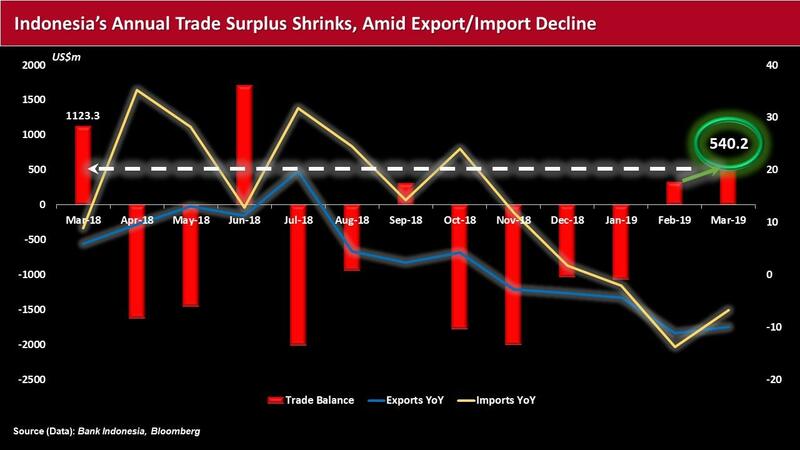 Elections are set to erupt across Indonesia’s volcanic archipelago in the week ahead, while weak export activity has fueled a narrowing in the country’s current account surplus. Among its strategies to prop-up inflation to a target of around 3.5% +/-1pp in 2019, Indonesia’s government has aimed at encouraging regional trade co-operation, as well as improving its infrastructure. However, slowing global growth seems to have dampened consumer prices and hampered exports. Meanwhile, Indonesian stocks have been no exception to the positive performance enjoyed by other emerging market equities, amid the U.S. Federal Reserve Bank’s shift in monetary policy towards a more dovish stance. Against this backdrop, landmark general elections are set Wednesday for Indonesian voters to cast ballots for its president, vice president and members of the People’s Consultative Assembly. According to Bloomberg, citing data from the statistics office, shipments of oil and gas, as well as mining and others, led the annual decline by 18% and 15.4%, respectively. Meanwhile, first quarter of 2019 exports dropped by 8.5% year-on-year to just north of US$40.5bn, while imports fell 7.4% to US$40.7bn over the same period. For the week ended April 10, Thomson Reuters/Lipper U.S. Fund Flows reported a net inflow of roughly US$600m into emerging market equity funds, contributing to a whopping total of more than US$18bn this year, while at the end of March, more than US$1bn worth of inflows reportedly made their way into EM debt funds year-to-date. 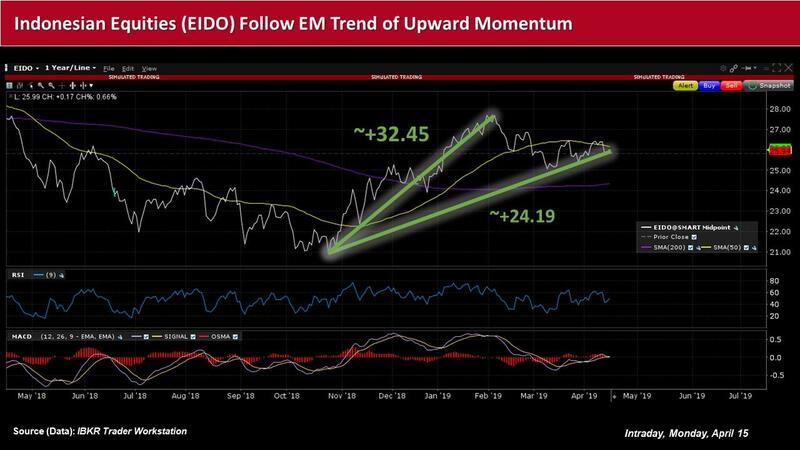 Indonesian equities – as evidenced by the iShares MSCI Indonesia ETF (NYSEARCA: EIDO), which has among its top holdings several financial sector firms such as Bank Central Asia (OTCMKTS: PBCRF), Bank Rakyat Indonesia (OTCMKTS: BKRKF) and Bank Mandiri (OTCMKTS: PPERY) – have climbed almost 24.2% from their most recent 52-week low set in October 2018, and soared 32.45% to set a new one-year high in early February 2019. Moreover, Fitch cited that Indonesia's relatively low government debt burden would likely provide a cushion in the event of a spike in market volatility and subsequent, severe fluctuation in exchange rates – albeit sans a massive rundown in foreign-currency reserves – while large banks also remain resilient to significant stress. 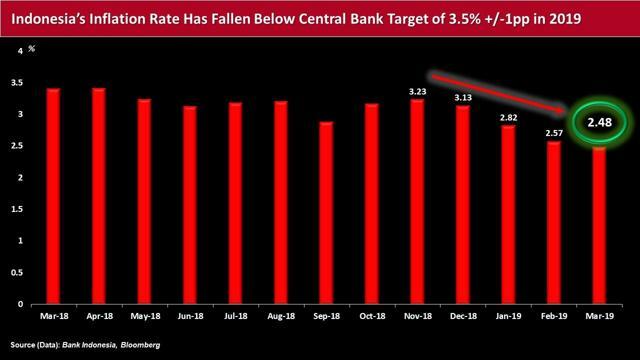 After Indonesia’s central bank elected to lift interest rates by a total of 175bps in 2018, Fitch said it expects policy rates to remain stable at 6.0% through 2020 – in line with Bank Indonesia’s aim to “strengthen external stability by controlling the current account deficit and to maintain the attractiveness of Indonesian financial assets. Indonesia's government is also committed to prudent management of its debt and has been generally promoting a conservative approach to fiscal policy in the run-up to its upcoming elections. The country’s external debt grew 8.8% year-on-year in February 2019, up from 7.2% in the previous month, mainly as a result of financing government spending and investment via its state-owned enterprise-driven (SOEs) infrastructure projects. Bank Indonesia noted that the government’s external debt financing targeted “productive sectors to promote growth.” as well as improving public welfare, including human health and social work, construction, education and financial and insurance activities. In 2018, Indonesia's government debt comprised almost 30% of GDP. The rate of Indonesia’s actual GDP growth was realized at 5.18% year-on-year in the fourth quarter of 2018, up slightly from the 5.17% posted in the previous period. 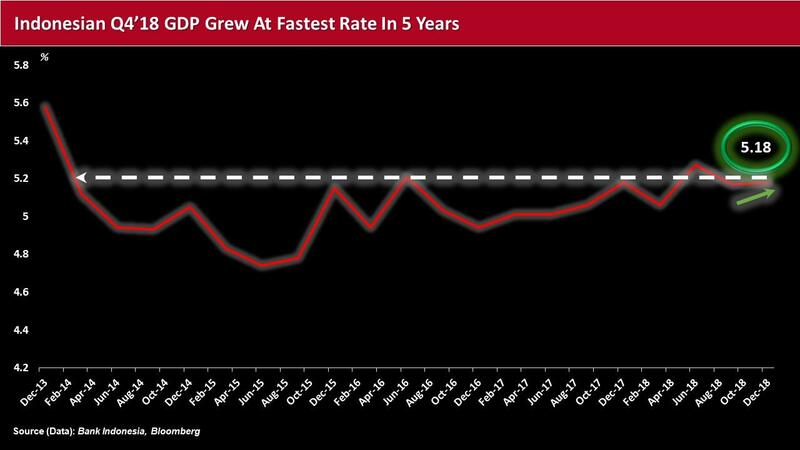 Growth for the year rose 5.17% from 5.07% in 2017, representing the fastest pace recorded in the past five years. Bank Indonesia pointed out that domestic demand was the “key driver” of economic growth in the last three months of 2018, which it primarily attributed to household consumption and “sound” investment performance, as well as to the financial services sector. Fitch Ratings analysts Thomas Rookmaaker and Sagarika Chandra recently highlighted that consumptioncontinues to help underpin Indonesia’s growth, which has benefitted from a civil servant salary bonus, as well as a 30% rise in the nation’s social assistance bill. The run-off pits incumbent Indonesian President Joko Widodo and his running-mate Muslim cleric Ma'ruf Amin against former general Prabowo Subianto and former Jakarta deputy governor Sandiaga Uno for a coveted five-year term (2019-2024) – in a rematch from the 2014 elections. The vote will reportedly mark a mammoth, complex effort to wrangle more than 190 million eligible voters across the archipelago’s estimated 17k-18k islands, with more than 16 parties participating in a historic same-day vote for both president, vice president and members of parliament. Note: This material was originally published on IBKR Traders' Insight on April 15, 2019.